Sarah Frankcom, in directing Strindberg’s Miss Julie at the Royal Exchange, resists the impulse so often indulged by the company to take classic drama out of its context and make crass points on twenty-first-century issues. And, given Strindberg’s confrontation with class and feminism, this would have been easy to do. Strindberg’s play was written in 1888, on the cusp of massive social change - class barriers were dissolving, religious certainties collapsing, the Woman Question was in the air (especially as voiced by Strindberg’s bête noir, the progressive Ibsen). The new form of naturalist drama and the formal experiments of Strindberg create a new drama appropriate for the age. This involved such techniques as doing away with act and scene divisions, for instance, having actors perform mundane tasks to ensure a continuous flow of dramatic action while significant events take place off stage. The production deviates from this with a flawed interlude where time is suspended and realism eschewed for a masque-like love triangle enacted between peasants, singing to a violin that seemed to symbolise eternal conflicts and resolutions between the sexes. The actual text maintains the continuous narrative, with peasants invading the kitchen from the Midsummer festivities that have provided the backdrop, dancing, drinking, and singing a bawdy folk song that is aimed at Jean and Julie’s transgression, and urges them further into tragedy through its scandal-mongering. Strindberg engages with another contemporary strand in naturalism—the determination of character by the weight of culture or even heredity. The bleak fatalism whereby the characters cannot escape their class and sexual identities seems to suggest that determinism, yet the performance brought out brilliantly the bad faith and evasion of responsibility that is in the text and which undermines that current. Maxine Peake (well-known for TV’s Shameless) was mesmerising as the domineering and snobbish man-hating young woman, Miss Julie, her aristocratic pretensions stripped away by sexual desire for her father’s valet, Jean. This leads to the fatal compromise of her status in the eyes of servants and peasantry and, indeed, herself. 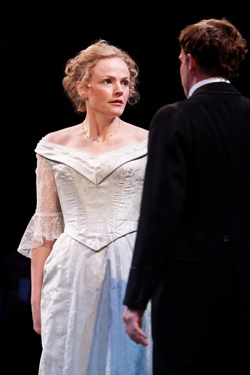 Miss Julie has been educated into a caricatured feminism (which Strindberg abhorred) whereby her femininity has become distorted and monstrous, urging her to transcend her gender and achieve ‘masculine’ dominance. Yet, in this performance—powerful as it is—she is, perhaps, too imperious; I read Julie as more vulnerable and girlish (she is 25 according to the text; Jean is 30). Joe Armstrong was excellent, too, as the ambitious, manipulative Jean, with his entrepreneurial aspirations of escaping to the (significantly) republican Switzerland and starting a hotel business based on the exploitation of the failed dreams and short life of eloping lovers’ affairs. He is often blackly funny in his strategic deceptions and self-seeking cruelty, yet pathetic, too, as his bravado finally collapses under the weight of traditional class deference. Carla Henry as the cook and Jean’s fiancée, Kristin, brought out much in her performance of a character far less fully sketched than the principals. She displays a stoical strength and practicality, yet revealing the quietism of that passivity in the face of tradition. The play dramatises the power of ideologies of class and gender over individuals, and the inauthenticity involved in succumbing to those constraints. What makes it still live is not the obvious tragedy of a woman destroyed by patriarchal power (though this is part of it), but the complexities and ambiguities of Strindberg’s arguments, often with himself, and the persuasive embodiment of that struggle in living human beings. This performance delivers that persuasiveness skilfully and very movingly.